Atlanta, which opened its starter modern streetcar line December 30, 2014, has ambitious plans for expansion into a streetcar network, the atlantacurbed.com site reports. The plans were presented by the Beltline organization and call for 50 miles of streetcar route, mostly within the future Beltline ring. One line would run around the Beltline, three would cross the city east-to-west, and two more would have north-south alignments. 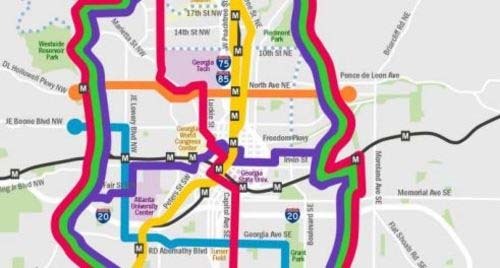 The only identified line that would cross the Beltline would run along Peachtree from Lenox Square to Fort McPherson, bolstering service in the inner-city.